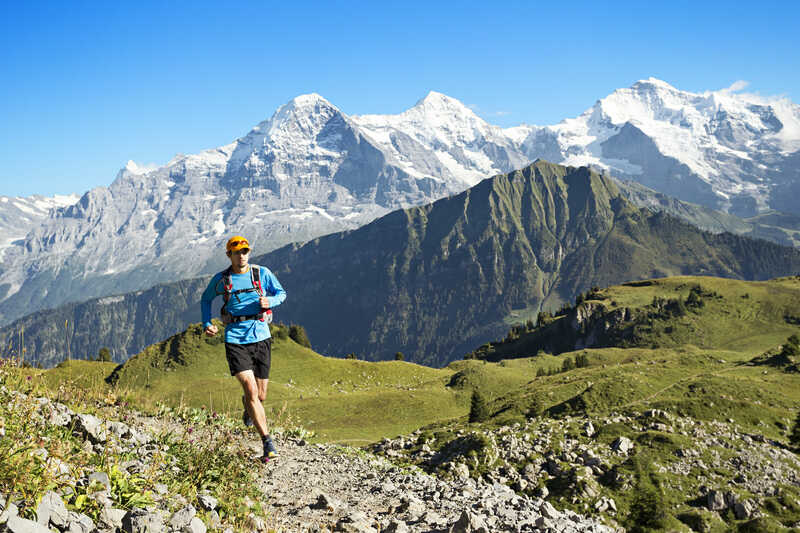 In the course of exploring the many topopgraphic nooks and crannies of Switzerland in search of great trail running, there are some really happy surprises to be found. At the end of the deep Lauterbrunnen valley, tucked under the cliff walls that form the base of the Jungfrau and Breithorn, is one of those places: the tiny village of Stechelberg. A few minutes walk outside of town, over a bridge that spans the Weisse Lütschine river, is one of the most beautiful buildings I’ve ever seen. Not fancy, mind you. Simple. Weathered. With a welcoming, open porch. It’s the Alpenhof Stechelberg. The Alpenhof Stechelberg: It’s not Five Star, and that’s kind of the point. The Alpenhof was once part of the Naturfreunde Schweiz or Swiss Nature Friends network of simple, low-key housing for backpackers and outdoors vacationers. Mark and Diane, the couple who own the Alphenhof, had worked as caretakers there. Two years after returning to England, however, Nature Friends put the building up for sale. Having barely been welcomed back by their former bosses, Mark and Diane found themselves again saying their goodbyes—this time, for good. Some places have a vibe all their own. An authentic voice that hints that, behind the scenes, there’s someone who’s charted a very intentional path. These places and the people who occupy them, are refugees from a world filled with the clutter of marketing, hype, and the “it’s-always-done-this-way” mindset. Some of the Run the Alps crew, after a great day of trail running exploits. The Alpenhof is one of those places. Open the ancient wooden door with the funky latch, and you’ll be warmly greeted by fellow guests, many of whom return year after year. You’ll find Mark in midst of a repair on the timeworn building, or Diane keeping the bookings running smoothly. Or the added bonus of their more-than-a-bit self-confident, daughter, Ellen. Just 6 years old, she’s one part eager hotel tour guide and one part new best friend. There’s no hot tub. No TV. Not even—gasp— an Internet connection. Showers are shared, and bedrooms are just that. Dinner is DIY, and prep is shared in a communal kitchen. Leave all those accoutrements behind, though, and what rises to the top? Conversation with fellow travelers about the day’s adventures, or sitting on the porch watching the sunset over the village of Mürren, 800 meters above. In other words? You’d be hard-pressed not to relax here. That’s Chinese writer Lin Yutang. I can’t say I’ve read his work—my reading is at the other end of the spectrum, slumming with the likes of David Sedaris and Tom Perrotta– but this quote has resonated with me for years. And, nowhere is the spirit of Yutang better exemplified than the Alpenhof Stechelberg. Oh, and the mountains, forests and pastures around the Alpenhof ? You’ll find some of the best trail running in the world. But that’s another story, for another time.